…..never underestimate the value of a major daily trendline getting whacked. As I write we are in the middle of the Asian session and EUR/USD is showing signs that its massive daily trendline is under pressure. I've written about it before but perhaps a quick reiteration: traders love these breaks as they are clean, visible and obvious in terms of their interpretation. But (and there is sometimes a “but”) my thoughts are slightly hesitant given the current cyclical environment. First, let's talk about a target on a break like this. Off the cuff, a good starting point puts a decent short term target on EUR in the 1.2990 area. That's the 23.6% retracement of this last major trend and falls in line with the highs of the last major block of price (those highs range from 1.2991 to 1.3028, approximately). Additionally, it would give us a good view in terms of price symmetry of this last major thrust to the upside following non-farm. 1.3154 is really the last of the obstacles to beat before the rest of our talks can be relevant here. At the time of this writing (1.3170), there is confluence at that price with one last trendline that needs to get surpassed (not drawn above). The larger one, however, appears to be busted for now. In terms of longs on EUR/USD, it is assumed that the majority of traders that wanted to go long on this pair from a cyclical basis have done so already. We never got much of a fade prior to month end, and we are now in a somewhat parabolic scenario following a nasty downtrend driven by the Greek credit crisis. We are now sitting in limbo between mixed reports and analysts scrambling for the next major move but for the most part the consensus appears negative. Lackluster data has no doubt acted as a catalyst for this last move higher, and we are eager (very eager) to hear about any major positive news coming from the United States. For instance, a very strong non-farm number would have probably sank this pair last week faster than the dickens because one of the primary reasons it has been getting so strong is a “failure to impress from the US”. We got a preview of how eager traders were looking for strong US data when last week's non-manufacturing PMI number got released. It sank EUR/USD about 85 pips in the hour following the release. That kind of impact on a PMI number is tough to ignore. Our ears are on the data calender awaiting anything else that could have a positive (or negative for EUR) affect on the dollar. I also want to touch on briefly the impact of last week's non-farm number. While the actual number came in yet again lower than estimates, unemployment held steady at 9.5%. Had unemployment came in worse we could have seen more of a downhill battle here in the past day of trading. Regardless, this trend is by faint definition, overextended, and needs to cool off at some point. The ones that draw the most attention, GDP, CPI, Claimant Count, Retail Sales, have been faring well over estimates and needless to say, reflected in recent price action. Since the beginning of this data trend (July 13), we were trading around the 1.5000 handle. 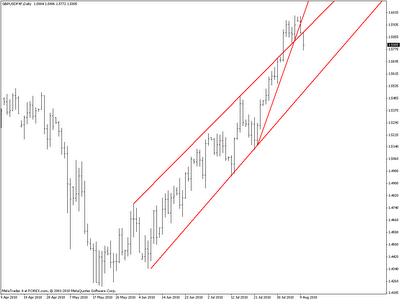 Since this trend started, we have seen an increase close to 1,000 extra pips on the pair. Bottom line: don't ignore the numbers. Trying to fade this kind of cyclical trend is not for the faint of heart. It has had a positive effect on higher yielding currencies as a whole, and we haven't even discussed Australia, Canada, New Zealand, etc. The dollar has been subject to a higher standard set in terms of performance that it has been unable to fulfill. But all good things of course don't last forever, and tonight we are seeing a sharp correction. Eyes are on the 1.5920-60 area for pullbacks and fades, dependent upon how low we want to go before such an event could occur. A triple top followed by lower lows yesterday gave a good indication that the current continuation thrust was losing steam. Additionally, world equity markets have been doing well over the past few weeks, adding to the ‘risk-on' scenario, in which higher yielding currencies get the push and the dollar suffers. When it comes to heavy trends like this, one thing I really like to see is one last parabolic shove to the upside before complete and utter failure. Once that happens your probability for success in fades generally increases quite a bit. GBP has exhibited signs of this happening due to its recent string of data, while EUR has shown less in this regard. From a technical perspective, this is my larger concern at this point. Tonight's sharp break of some key technical levels could continue to put us in a correction phase….but the book is always open. My view is to remain patient for the next string of relevant data and see what it brings and particularly, listen carefully for high-impact strong US data or very poor European news. Regardless, the seeds are being planted and wheels in motion. Look for any backward bounces off of these lines / quasi patterns / 61-79% pulls or other topping structures for confirmation. 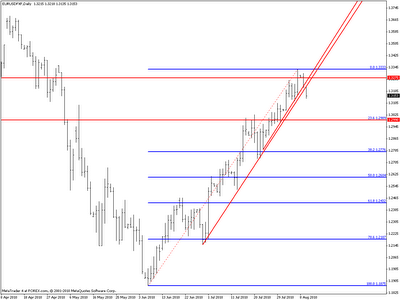 Good article and I agree with you that the euro is going to see some retracement. Thanks by the article! i bet about this–> http://img535.imageshack.us/img535/3867/89731956….